MIKE CLARK gained worldwide recognition as one of America’s foremost jazz and funk drummers while playing with Herbie Hancock’s group in the early 1970’s. Mike became known as a major innovator through his incisive playing on Hancock’s Thrust album, which garnered him an international cult following. Mike has performed with jazz greats such as Herbie Hancock, Chet Baker, Tony Bennett, Wayne Shorter, Joe Henderson, Bobby Hutcherson, Woody Shaw, Larry Coryell, Jack Wilkins, Wallace Roney, Geri Allen, Billy Childs, James Genus, Bob Hurst, Chris Potter, Onaje Allan Gumbs, Bobby McFerrin, Al Jarreau, Dave Liebman, Nat Adderly, Oscar Brown Jr., Bill Doggett, Mose Allison, Maxine Brown, Gil Evans and his orchestra, and did a stint with Brand X, the acclaimed British fusion band, founded by Phil Collins. He has performed throughout the world at all the major jazz venues and festivals. 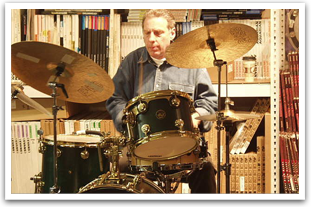 Featured in Downbeat, Musician, International Musician & Recording World, Modern Drummer, Jazz Times, Guitar Player, Jazz Is and numerous jazz history and method books, Mike is a former faculty member of Drummers Collective, and is a popular and busy clinician around the country. 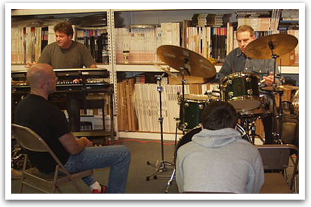 His book Funk Drumming: Innovative Grooves & Advanced Concepts was published last year by Hal Leonard and is a best seller. Called “the most sampled drummer in hip hop” Mike’s beats have been used on tracks by musicians as diverse as NWA, Grandmaster Flash, Britney Spears, Prince and many others. His numerous recording credits include albums with Herbie Hancock, the Headhunters, Brand X, Eddie Henderson, Jack Wilkins, Mark Puricelli, Mike Wolff, and Alien Army, a group led by guitar great Jack Wilkins. As a bandleader, his release Give The Drummer Some was very enthusiastically received, earning a rare four and a half stars in Downbeat, as was The Funk Stops Here, a joint effort with Hancock alumni Paul Jackson. In 2001, his solo CD, Actual Proof met with critical acclaim, as did the 2003 acoustic jazz release, Summertime, featuring Chris Potter and Billy Childs, which spent many weeks in the top ten charts.